NFC TIMES Exclusive – As the NFC tag industry responds to iOS 11, Apple Watch isn’t drawing much focus, and use cases for tag-reading on the wearable remain limited. Apple is targeting the fitness niche among other users for NFC with its new Apple Watch and also its iPhone running iOS 11. Tag ecosystem experts don’t see a lot of interest yet in tag reading applications for the watch but do see interest in tag reading for the iPhone. For the foreseeable future, it seems, the vast majority of uses with the Apple Watch will be for payments and other card emulation applications. The tag ecosystem has seen an uptick in activity in recent months, especially in the U.S., where Apple holds 30% to nearly 45% smartphone market share, depending on the month, according to Kantar Worldpanel. IOS developers already have the first NFC reader applications in the Apple Store, and tag vendors have launched new software development kits, SDKs, to support them. Meanwhile, consumer brands have shown increased interest and willingness to invest in tag campaigns, according to such vendors as Blue Bite and Identiv. But so far, the vast majority of the movement in the new ecosystem for iOS-enabled tags is centered on the iPhone itself. 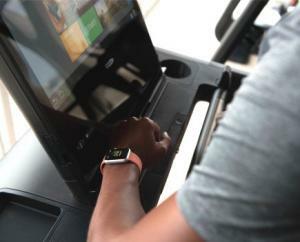 The Apple Watch, for the moment, remains a novelty rather than a driver of new tag applications. As NFC Times reported in June, Apple NFC tag reading will not be as open as tag reading in Android phones. Apple included the Apple Watch as a fitness tool during its September 12 release announcement for the iPhone 8, iPhone X and Watch Series 3. In fact, the example of using the watch to tap fitness equipment to check in, a feature Apple calls GymKit, got more time than any other use case for NFC, with the possible exception of Nike’s new tagged jerseys. What remains unclear is how many gyms will install NFC-enabled workout equipment–and when. At least four of the largest workout equipment vendors in the U.S.–Life Fitness, Matrix Fitness, TechnoGym, and Core Health Fitness (manufacturer of the StairMaster) may produce tagged machines, but it’s not yet clear if all newly produced machines will feature the tags or only high-end models. It’s also not clear how quickly most gyms will move to install the NFC-enabled equipment, but it’s likely that for most, the upgrade will come with their regularly scheduled equipment replacements, which usually run on two-year cycles. And more than a month after the release, industry observers say GymKit is one of the very few clear, obvious use cases out there for the Apple Watch other than payments and ticketing, and most brands remain focused on the potential of the iPhone, not the Apple Watch, for tapping NFC tags. “I would say that outside of that fitness niche, people are really thinking about tapping your phone to a product,” said Paul Knight, CPO of digital marketing company Blue Bite. That’s likely due to a number of factors, starting with the fact that iPhones are an overwhelmingly large share of the market compared to the Apple Watch. “The phone has a very dominant role to play in ensuring that service providers, whether it be transit or retail, provide an experience for all of their customers; so while there might be some unique applications that show up on the Apple Watch, I think you’ll see more applications being developed that run across the mobile platforms because it’s just a much larger user base right now,” NFC Forum executive director Paula Hunter told NFC Times. And at least in the near future, only a small subset of Apple Watches on the market will be able to function without a linked iPhone nearby. While a version of the newly released Apple Watch Series 3 does come with the ability to function as a standalone cellular device, enabling users to leave their phones at home and receive calls, messages, and other updates on the watch–and log a workout by tapping tags on gym equipment–the less expensive version of the new smartwatch lacks that ability to function without being tethered to the iPhone. So does the older Apple Watch 2, whose tag-reading mode is also enabled with iOS 11. The fact that a large percentage of Apple Watches still need to be tethered to their iPhones perhaps gives developers little reason to develop standalone NFC content for the wearable. “I’m fairly sure that the watch will, let’s say, have a role in that ecosystem at some point in time, but it’s a very remote way of looking at things right now,” Identiv’s Mueller told NFC Times. And the limited tag-reading use cases for Apple Watch also owe something to the functional limits of the smartwatch itself, with its much smaller screen and its– relative to the iPhone–less robust operating system. Other check-in use cases for the Watch might include in-store check in, which would allow brands to gather analytics potentially connecting users’ in-store visits to their earlier online interactions, or to subsequent online purchases. That could also be done with a user’s handset, of course, although wearables like the Watch might be faster and more convenient. But NFC check-ins never took off with NFC-enabled Android devices, so there is little indication that campaigns involving check-ins targeting Apple users would fare much better. And brands and stores would undoubtedly have to offer customers some sort of incentive for that behavior, such as rewards points, discounts, or coupons, and it’s not clear whether any retailers have made serious moves toward implementation of such a concept. “It is not so much about the visuals that show up on the phone. It’s just about what you can do through that digital communication,” Knight told NFC Times. And much of that depends, according to NFC Forum’s Hunter, on the imagination of app developers. “I just think it’s a great opportunity for developers to come up with new use cases for the wearables,” Hunter told NFC Times. “It will be interesting to see where they take it for things like transportation,” she added, suggesting train ticketing and airline boarding passes as potential use cases. Those would likely rely on Apple Wallet functionality rather than tag reading, however. Other potential tag-based use cases for wearables, such as unlocking smart car locks or serving as digital hotel room keys, aren’t likely to be available to the Apple Watch or the iPhone in the near future, because iOS 11 allows only read-only mode, not transmitting data in a way that would enable those applications. “The way iOS 11 has been opened up for iPhone, it is supporting NDEF reading capabilities, but apparently not yet the writing of it (tags),” said Mueller. That means that while some connected home applications could work, they would require the Apple Watch, or the iPhone, to be reading a tag and checking in, not sending or writing data such as alarm clock or thermostat settings. And the Watch–along with the iPhone–won’t be able to tap to authenticate products using tags with unique identification, or UID, numbers, either, because iOS 11’s Core NFC specifications enable the iPhone and the Apple Watch to read the standard NDEF record on a tag, but not its UID or other special features. Meanwhile, the first NFC reader applications are already in the Apple Store, and a few tag vendors have been quick to launch SDKs to support iOS developers’ forays into NFC applications. Piggybacking on Apple’s launch of tag-reading capability in iOS 11, late in September, chip supplier NXP Semiconductors released its iOS 11 toolkit, and tag and reader vendor Identiv, which maintains a close relationship with NXP, last week announced its Tag Starter Kit for NFC Forum Tag Types 2, 4, and 5. “We have explicitly focused on Type 2, 4 and 5 due to our partnership with NXP,” said Mueller, who told NFC Times that NXP and Identiv had coordinated closely on their respective SDK releases since Apple’s June announcement that iOS 11 would finally open up tag reading in Apple devices. NXP does not produce Tag Types 1 and 3, which the SDK omits, but some of its competitors do. Tag Type 3 supports the Sony FeliCa standard, also called Japanese Industrial Standard (JIS) X 6319-4. Type 1 tags have a larger memory size than Type 2–96 bytes compared with 48 bytes, though both are expandable to 2 KB; both are based on the ISO 14443A standard. “We had started working on this basically the day the first beta release notes of iOS 11 had been launched,” Mueller told NFC Times. The NFC Forum’s recently released Tag Certification Program wasn’t developed directly in response to iOS. Work had already begun on that project in October 2016, when the Forum’s Internet of Things Working Group, perhaps not coincidentally chaired by Apple, put together a set of requirements for a tag testing program. The Forum’s earlier certification scheme had focused on NFC readers and NFC-capable handsets, but did not include a certification for tags, which the new certification program adds. “I think you’ll see more crossover collaboration,” The forum’s Hunter told NFC Times, citing Apple’s close relationship with sportswear manufacturer Nike, which just released its Nike Connect line of jerseys with embedded NFC tags, alongside Apple’s Nike-branded Apple Watch and the Nike fitness applications that come preinstalled on iPhones. “A massive sports brand like Nike jumping onto that topic–there is some significant horsepower behind to push it,” Mueller told NFC Times. While Nike Connect hasn’t been on the market long enough for data to be available regarding how many consumers actually tap the embedded tags, let alone how many do so more than once, Knight says that Blue Bite has already seen an increase–albeit not dramatic–in Apple user interactions with its NFC tags. That’s despite an added layer of complexity in how the iPhone reads NFC. IOS 11 requires users to download an NFC reader app, which so far are third-party applications available in the Apple Store. Then to read a tag, they must open the app, and press a button within the app to actually read an NFC tag. That’s similar to the iPhone’s earlier approach to scanning QR codes, an approach the OEM discarded with its latest release in favor of allowing the iPhone’s native camera application to automatically scan the codes and prompt users to open them. It remains to be seen whether that shift in QR code reading points to the future of tag reading on the iPhone, as well. But for now, the NFC Forum’s Hunter contends that added step won’t be a barrier to Apple users, who are unlikely to be comparing their NFC experience to that of Android users and finding it lacking. “Most people don’t carry multiple phones in their pocket, so they’re either familiar with the iOS environment or the Android or the Windows Phone environment, and are not really cognizant of how it works on other platforms,” she said. And both Identiv and Blue Bite say that since the announcement, they have seen an increase in interest from consumer products companies, retailers, and advertisers in running tag-based marketing campaigns or embedding tags in products or packaging, although the vendors have not yet named any of the brands involved. Many brands, especially in the U.S. where Apple holds a significant market share, had been reluctant to invest in NFC as long as only Android users could tap the tags. The next year will tell whether Apple will have any more luck in getting users to tap NFC tags than Google did in years of trying with NFC-enabled Android devices. See the original story published here.